A German container ship which ran aground in the Dover Strait, off the coast of Kent, has resumed its journey to the Suez Canal and Malaysia. The 90,465-tonne LT Cortesia was declared seaworthy after surveyors from the Maritime and Coastguard Agency (MCA) spent the day on the vessel. The ship ran aground on the Varne Bank, nine miles (14km) south of Dover harbour, early on Wednesday morning. She was refloated by three commercial tugs at high tide the same evening. The ship was then anchored in deep water in an area called The Downs, three miles off Deal. It was allowed to resume its journey at about 1800 GMT on Thursday. Investigators from the Marine Accident Investigation Branch have also been inspecting the ship to try to discover why it ran aground on the well-known sandbank, which is clearly marked on all shipping charts. All 27 crew, who were unhurt, remained aboard while the vessel was aground and also during the refloating operation. 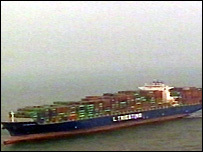 The ship was carrying 4,148 containers, some of which was "hazardous cargo", but they were reported to be secure. Dover Coastguard said the LT Cortesia was expected to take about two weeks to reach its final destination.